Recently announced on his personal Twitter page, Elon Musk said that the focus of his tunnel project, which will zip cars under the streets of LA at speeds of up to 150mph, has changed. Musk stated that pedestrians will be prioritised over private cars, revealing a short video along with the announcement, and adding that better one will be along shortly. 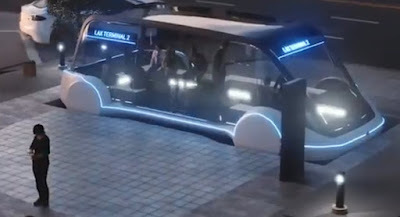 So, instead of driving your car onto one of those cool super-fast magnetic platforms, you could also board an enclosed one and get lowered down into the tunnel. Musk says he'd also like far more smaller stations, allowing people to stop closer to their destination than the likes of an underground train system allows. However, note Musk's use of the phrase "if someone can't afford a car...", suggesting that would be the only reason to use public transport. As opposed to, y'know, it's better for the environment, and potentially quicker. Rich white men, right? Still, good call from Musky.